Each bottle contains 120 metered doses of Budesonide BP. Each actuation delivers Budesonide BP 100 mcg. Budesonide is a synthetic corticosteroid having potent glucocorticoid activity and weak mineralocorticoid activity. It has approximately a 200-fold higher affinity for the glucocorticoid receptor and a 1000-fold higher topical anti-inflammatory potency than cortisol. Corticosteroids have been shown to have a wide range of inhibitory activities against multiple cell types (e.g. mast cell, eosinophil, neutrophil, macrophage, and lymphocyte) and mediators (e.g. histamine, eicosanoids, leukotriene, and cytokine) involved in allergic mediated inflammation. Adults and children 6 years of age and older: 100 mcg per day administered as one spray per nostril once daily. The maximum recommended dose for adults (12 years of age and older) is 400 mcg per day administered as four sprays per nostril once daily. Adverse local reactions following budesonide use are mild and usually transient. Systemic side effects have not been reported during clinical studies of budesonide nasal preparations. Sneezing, headache, sore throat, dry mouth, nausea etc. have been reported as the common side effects. 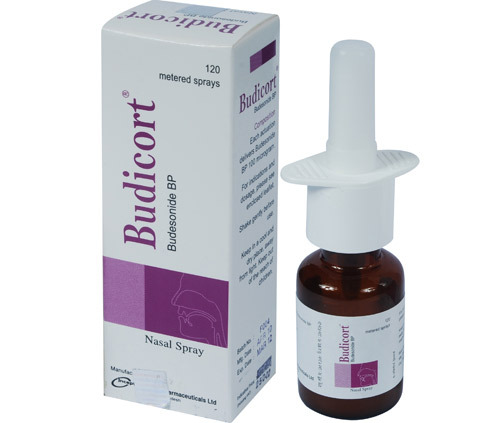 Budesonide nasal spray should be used with caution in patients with active or quiescent tuberculous infection, untreated fungal, bacterial, or systemic viral infections, or ocular herpes simplex infection. Patients with recent nasal septal ulcers, nasal surgery, or nasal trauma should not use a nasal corticosteroid. Pregnancy: Inhaled budesonide has been assigned to pregnancy category B by the FDA. Budesonide has not been shown to be teratogenic in animals when given in high doses by inhalation. Despite the animal findings, it would appear that the possibility of fetal harm is remote if the inhaled drug is used during pregnancy. Nevertheless, because the studies in humans cannot rule out the possibility of harm, inhaled budesonide should be used during pregnancy only if clearly needed. Lactation: The amounts of inhaled budesonide excreted into breastmilk are minute and infant exposure is negligible. Reviewers and an expert panel consider inhaled corticosteroids acceptable to use during breastfeeding. When taken by mouth, budesonide is only about 9% bioavailable; bioavailability in the infant is likely to be similarly low for any budesonide that enters the breastmilk.